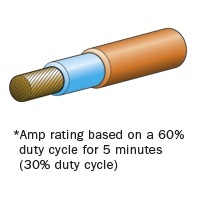 Welding cable available online including double sheathed welding cable supplied nationwide. Welding Cable we supply is made for the Australia snd New Zealand markets to AS5000.1 and exceed the specification requirements of standard AS995. The inner insulation is manufactured of V90HT nitrile moified PVC for resistance up to 90 degrees Celcius. Cable of this specification is often used to make heavy duty battery booster cable because of the flexibility of the special nitrile modified sheath and 0.2mm stranding. Nitrile modified PVC is very durable, doesn't kink and has a high resistance to heat, brasion and cuts.